Fuchs’ endothelial dystrophy is a non-inflammatory, sporadic or autosomal dominant, dystrophy involving the endothelial layer of the cornea. With Fuchs’ dystrophy the cornea begins to swell causing glare, halo, and reduced visual acuity. 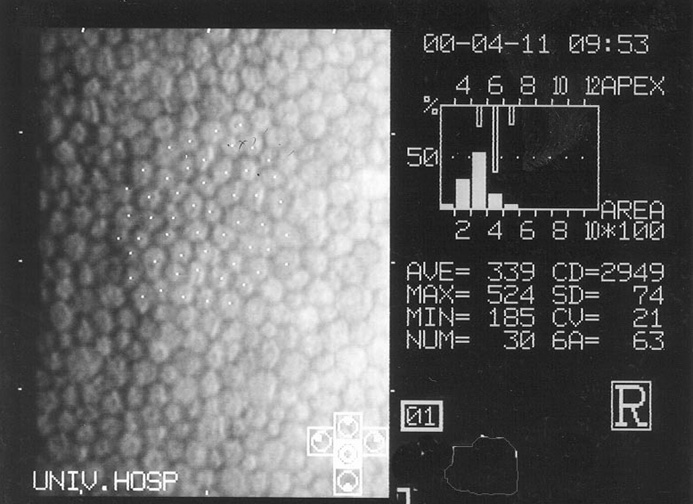 The damage to the cornea in Fuchs’ endothelial dystrophy can be so severe as to cause corneal blindness. Fuchs’ dystrophy is often inherited in an autosomal dominant manner. This means if you have an inherited form of Fuchs’ endothelial dystrophy there is a 50% chance you will pass it on to your children. Spontaneous mutation in the gene for Fuchs’ dystrophy also can cause new Fuchs’ dystrophy in a person with no family history. Currently there are studies underway to try and determine exactly which gene is responsible for the dystrophy, but as of yet we still do not know the exact gene. Some of the earliest symptoms of Fuchs’ endothelial dystrophy include reduced contrast sensitivity and mild reduction of visual acuity. 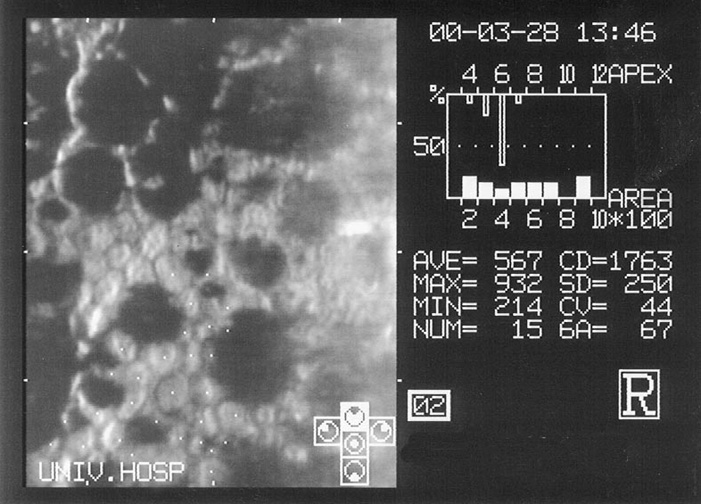 Patients will often notice glare around a point source of light or have difficulty with nighttime driving. As the dystrophy is often slow in onset, patients may not even notice that their vision is reduced. Once fluid begins to collect in the stroma, patients will start to notice fluctuation in vision, typically worse in the early AM and improving toward the end of the day. Vision may be worse on humid or rainy days, and better on dry days. Eventually the diurnal fluctuation reduces and vision becomes reduced all day long. Slowly the vision continues to worsen and eventually intermittent pain can be felt if bullae form and rupture leaving corneal epithelial defects. As Fuchs’ dystrophy progresses its medical treatment may fail, at that point surgical management becomes necessary. For many years the only option for patients with visually significant Fuchs’ dystrophy was a full thickness corneal transplant or penetrating keratoplasty (PKP). A corneal transplant involves replacement of the full thickness of the cornea in order to replace the endothelial cells. The cornea is held in place with multiple sutures and some sutures may stay in place for several moths to years. Though the surgery is very successful, recovery can be relatively slow sometimes taking a year or more for full visual recovery. The advantage of a full thickness corneal transplant is that it can restore vision even in the most advanced stages of Fuchs’ dystrophy and other necessary intraocular surgery can be performed at the same time as the transplant. Over the past several years there has been a trend to try and treat endothelial dystrophies by transplanting only the posterior, or endothelial, portion of the cornea. Posterior lamellar surgery has been refined over the past several years and now is becoming the standard of care in treatment of early to moderate Fuchs’ endothelial dystrophy. The most popular surgical procedure is currently named Descemet’s Stripping Endothelial Keratoplasty (DSEK) also known as Descemet’s Stripping Automated Endothelial Keratoplasty (DSAEK) and Descemet Membrane Endothelial Keratoplasty (DMEK). In DSEK/DSAEK only the endothelial layer is removed from the patients’ cornea and replaced by a thin strip of donor corneal stroma with attached, healthy, endothelial cells. In DMEK the endothelial layer is replaced by a healthy, endothelial cells on the very thin Descemet’s membrane. 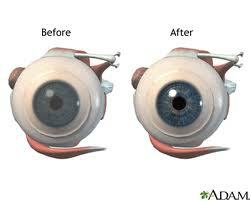 These surgeries can be performed through a much smaller incision than traditional penetrating keratoplasty. Once the cells are implanted into the eye they are held in place by an air bubble. Using this technique a minimum of corneal sutures are necessary and suture-induced astigmatism is minimized. Once the transplanted cells are in place, the patients’ cornea will be cleared of any excess fluid. Recovery is much more rapid than after a full thickness corneal transplant, with patients recovering vision after just a few months. An additional advantage to these new procedures is the smaller incision size which keeps the eye much more resistant to damage in the event of ocular trauma. 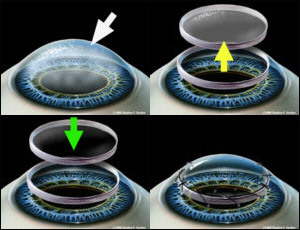 As with full thickness corneal transplants, other necessary intraocular surgery (such as cataract surgery) can be performed at the same time, however if the cornea is swollen reducing the ability of the surgeon to see into the eye, the associated surgery can be much more challenging. DSEK/DSAEK and DMEK are better options for mild to moderate Fuchs’ dystrophy as once the cornea is scarred from chronic swelling an endothelial transplant may not give satisfactory visual results. In the more advanced cases a full PKP is necessary. For more information on Fuch's Dystrophy, See our Patient Education Brochure, Here.